Cedarville is a very special place to live. One of the things that makes Cedarville Community Library unique is its StoryWalk®. If you don’t know what a StoryWalk® is, you’re in for a treat. Right on the trail and next to your library, you will find 17 exhibit stands. Inside each is a two-page spread of a storybook, specially selected by our Youth Services Librarian. Families can stroll around the park and read the story together. You can read it anytime, even when the library is closed! Consider an evening stroll after getting ice cream, or checking out the book on a normal library visit day. 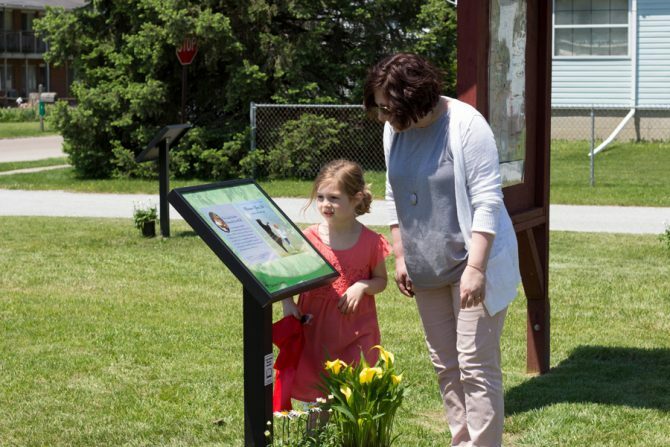 The StoryWalk® concept was created by Ann Ferguson in collaboration with the Kellogg-Hubbard Library in Montpelier, Vermont, to promote early literacy, family time, and physical activity. There are now StoryWalks® all over the world, including every state in the United States. 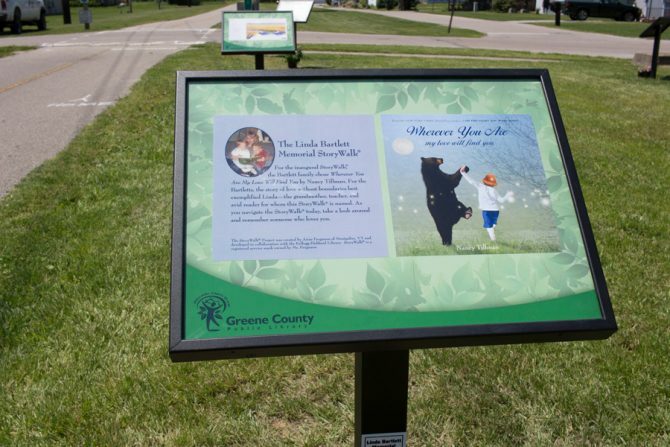 Lucky for us, our StoryWalk® is a permanent display, where we can change the story out every few weeks or months, so there’s always a new story for you to enjoy! Our StoryWalk® is the Linda Bartlett Memorial StoryWalk®, created in May 2017 in honor of library patron Linda Bartlett, an educator and lover of children’s books. Linda’s family established a fund to allow Cedarville Community Library to create something that could be enjoyed by the entire community. With the help of the Village Administrator, we were able to add this lovely feature to Cedarville. The Friends of the Cedarville Community Library pledged their continual support with the purchase of all of the books used in the StoryWalk®—and sometimes extra copies for an in-house drawing, such as during our Summer Reading Kickoff Party. This month starts the 2019 StoryWalk® Season with We're Going on A Bear Hunt, the much-beloved book by Michael Rosen and Helen Oxenbury. This year marks the 30th anniversary of this book, so it is a great time to reintroduce yourself and your children or grandchildren to this fun story. We hope you’ll love our StoryWalk® as much as we do, and stop into the library to tell us about it, too. We are proud of Cedarville Community Library and love to make reading even more accessible to all.